Daily fantasy sports took off overnight. 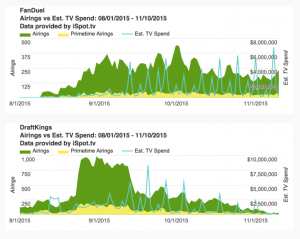 Now, you can’t watch television without spotting a commercial sponsored by DraftKings or FanDuel. But here is an interesting question to ponder: what will happen if the daily fantasy sports industry begins to fall off? This may not be coming any time soon, but with many states considering a ban or regulation, you never know what the future holds. Not only will this upset a lot of people, but it will take away millions of dollars in ad spending. Watch football on any Sunday and you are sure to see one fantasy sports commercial after the next. According to iSpot, the two giants in the industry have collectively spent more than $220 million on advertising since the NFL season got underway in August. While this is sure to drop off after the NFL season comes to an end, it won’t stop completely. There are still other sports, such as basketball and hockey, which generate a good bit of money for these services. Not as much as football, but still worth noting. That’s big money no matter how you look at it. Even with the current issues regarding regulation, it’s not likely that daily fantasy sports will disappear entirely. Things may change, but the industry is too strong to be killed off. Of course, if major changes are made, if the industry was to up and disappear, media companies would definitely take a hit. What are your thoughts on daily fantasy sports commercials? Do you enjoy seeing these spots? Previous story FanDuel Identify Verification: What’s the Deal?